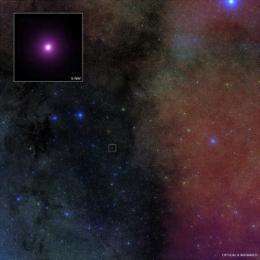 (PhysOrg.com) -- New results from NASA's Chandra X-ray Observatory have made a major advance in explaining how a special class of black holes may shut off the high-speed jets they produce. These results suggest that these black holes have a mechanism for regulating the rate at which they grow. Black holes come in many sizes: the supermassive ones, including those in quasars, which weigh in at millions to billions of times the mass of the Sun, and the much smaller stellar-mass black holes which have measured masses in the range of about 7 to 25 times the Sun's mass. Some stellar-mass black holes launch powerful jets of particles and radiation, like seen in quasars, and are called "micro-quasars". The new study looks at a famous micro-quasar in our own Galaxy, and regions close to its event horizon, or point of no return. 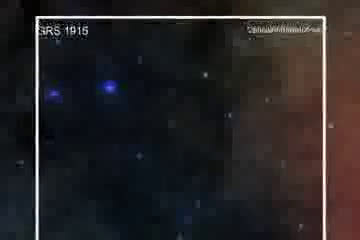 This system, GRS 1915+105 (GRS 1915 for short), contains a black hole about 14 times the mass of the Sun that is feeding off material from a nearby companion star. 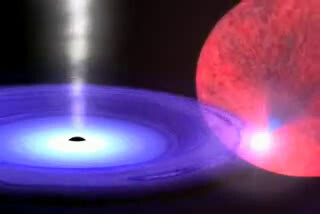 As the material swirls toward the black hole, an accretion disk forms. This system shows remarkably unpredictable and complicated variability ranging from timescales of seconds to months, including 14 different patterns of variation. These variations are caused by a poorly understood connection between the disk and the radio jet seen in GRS 1915. Chandra, with its spectrograph, has observed GRS 1915 eleven times since its launch in 1999. These studies reveal that the jet in GRS 1915 may be periodically choked off when a hot wind, seen in X-rays, is driven off the accretion disk around the black hole. The wind is believed to shut down the jet by depriving it of matter that would have otherwise fueled it. Conversely, once the wind dies down, the jet can re-emerge. "We think the jet and wind around this black hole are in a sort of tug of war," said Joseph Neilsen, Harvard graduate student and lead author of the paper appearing in the journal Nature. "Sometimes one is winning and then, for reasons we don't entirely understand, the other one gets the upper hand." The latest Chandra results also show that the wind and the jet carry about the same amount of matter away from the black hole. This is evidence that the black hole is somehow regulating its accretion rate, which may be related to the toggling between mass expulsion via either a jet or a wind from the accretion disk. Self-regulation is a common topic when discussing supermassive black holes, but this is the first clear evidence for it in stellar-mass black holes. "It is exciting that we may be on the track of explaining two mysteries at the same time: how black hole jets can be shut down and also how black holes regulate their growth," said co-author Julia Lee, assistant professor in the Astronomy department at the Harvard-Smithsonian Center for Astrophysics. "Maybe black holes can regulate themselves better than the financial markets!" Although micro-quasars and quasars differ in mass by factors of millions, they should show a similarity in behavior when their very different physical scales are taken into account. "If quasars and micro-quasars behave very differently, then we have a big problem to figure out why, because gravity treats them the same," said Neilsen. "So, our result is actually very reassuring, because it's one more link between these different types of black holes." The timescale for changes in behavior of a black hole should vary in proportion to the mass. For example, an hour-long timescale for changes in GRS 1915 would correspond to about 10,000 years for a supermassive black hole that weighs a billion times the mass of the Sun. "We cannot hope to explore at this level of detail in any single supermassive black hole system," said Lee. "So, we can learn a tremendous amount about black holes by just studying stellar-mass black holes like this one." It is not known what causes the jet to turn on again once the wind dies down, and this remains one of the major unsolved mysteries in astronomy. "Every major observatory, ground and space, has been used to study this black hole for the past two decades," said Neilsen. "Although we still don't have all the answers, we think our work is a step in the right direction." The jets from a black hole come from within the black hole. It is true that nothing can escape a black hole if gravity is the only force in question because the acceleration is less than -c/sec. However, since gravity is not the only force in question, the acceleration on objects inside the black hole can be greater than -c/sec (i.e. abs. value is < c/sec). This occurs at the poles due the rapid spin of the star creating a tremendous magnetic field which spews out positively charged particles at one pole, and -vely charge particles at the other. The on/off behavior depends on the amount of charged matter (and also the rate of spin, but this won't likely change rapidly). At last a mechanism has been observed that may be scaled up and account for jet regulation in supermassive black holes (SMBHs). It has long been noted that SMBHs can regulate their rate of intake of matter and conversely the strength of their polar jets. This observation serves as a viable mechanism for regulation of a black hole' intake. check out the paper, at: http://arxiv.org/...73v1.pdf . The paper mentions GRS 1915 105 as a 14 solar mass black hole accreting matter from an 0.8 solar mass K3 IV star. Wow, thanks Wz. Great link! A fascinating paper & page link appear today (3-31-09) on the arXiv site describing the view of a observer falling into a Schwarzschild Black Hole. Two astrophysicists from Colorado have posted multiple movies of this phenomenon with some eye-popping visuals at: http://casa.color...chw.html with easy to understand explanations on what is being illustrated-animated. The companion paper is here: http://arxiv.org/...7v1.pdf. Though their web site is still under construction, I encourage all interested in Black Holes to check out their page "Journey into a Schwarzschild black hole" at the URL above. Some great work on the web page explaining for laypersons the workings of a Black Hole and other relatavistic phenomenon like gravitational lensing, Einstein rings, superluminal motion, etc. These animations are literally out of this world!